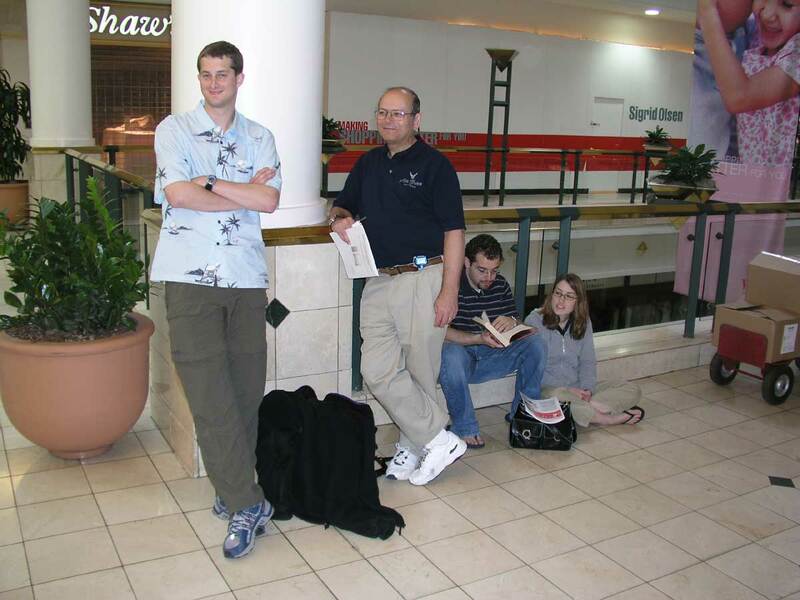 On Saturday, May 8th 2004, Jim Little, Nancy Little, and myself provided the nucleus of a Pi presence at the Grand Opening of the new Apple Retail Store in Westfield Shoppingtown Montgomery, more commonly known as Montgomery Mall. We arrived shortly before 8 am to find a few hardy souls camped out in front of the store entrance. As time went on a few people appended themselves to the line and proceeded to open up their laptops and test out the store's Airport connection. I had a moving dolly with 4 1/2 boxes of Pi Journals in tow and we proceeded to make sure that everyone in line got one as an introduction to the Pi and the benefits it offers. By 10 am the line had grown to about 400 people. Passersby in the Mall kept asking if something was being given away. The best answer that we had was "T Shirts." One lady introduced herself as being from Russia and she simply could not understand what the fuss was about. 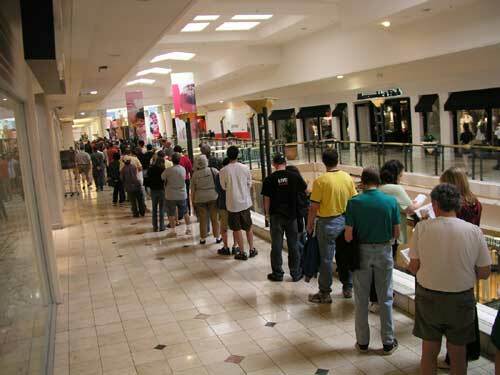 Of course in the old days Russians would queue up at the mere hint that toilet paper was available in a store. The idea that so many people would express such an affirmation of faith in a computer platform just went right by her. 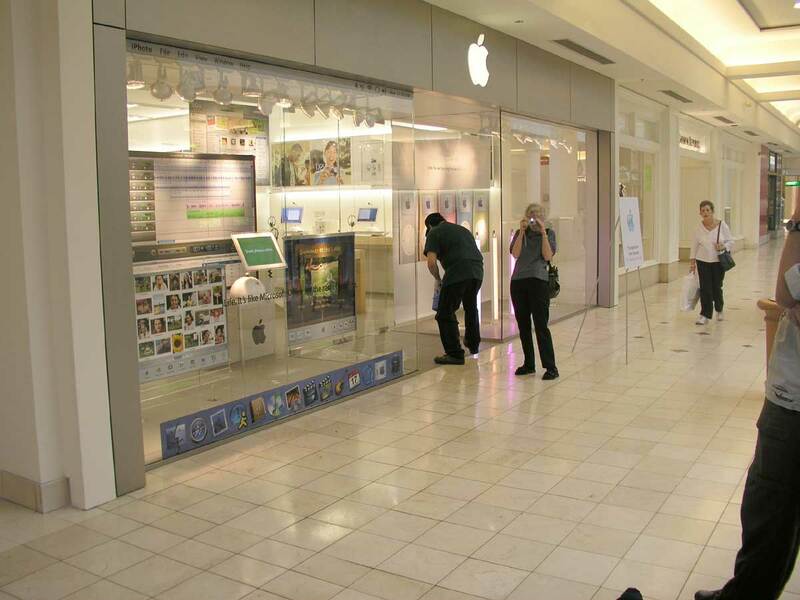 Of course there were those in line who wanted some assurance that iPod minis were available in the store. I had no way of knowing this. I don't count this as an affirmation of faith in Apple. The folks who weren't interested in the Apple platform were nonetheless impressed that a mere store opening could generate such a buzz. The younger generation was, on the whole, unaware of the Pi. Older folks knew who we were. Some had even been members once upon a time. A small, but select, coterie are still members. Once the store opened, at 10 am, the line started to shrink. The gentleman at the door would admit 30 or so people at a time to avoid overcrowding in the store. I stayed at the end of the line passing out Pi Journals to new people as they joined the line. By about 12:10 I was at the front of the line and I went into the store. I had given away something like 400 copies of the March/April and Jan/Feb Journals. By this time a couple of stalwarts like Abe Brody and "Jade" had ensconced themselves for longer visits to the store. I will say that there were more Apple goodies in the store than I am used to seeing in one place. There seemed to be examples of virtually every Macintosh computer model as well as the iPod appliances. There was a rich array of accessories and a quite comprehensive assortment of books, software, and gadgets. By the time I left it was around 1 pm. I estimate that 600 people or so had passed through the doors. I contacted the store to confirm this number, but they were unable to comment on the matter. They sent me into a telephone maze at Apple Corporate headquarters, but that was a waste of time. The floor area seems to be a bit smaller than the Clarendon Store and considerably smaller than the one at Tyson's. I did not notice a "theater" space and the "Genius Bar" seems a bit small. The store is, however, offering quite a number of free events for the public. 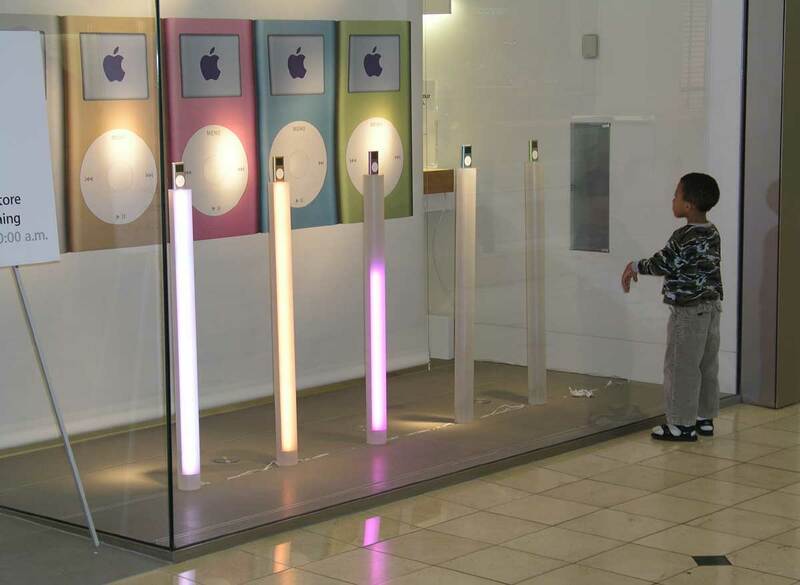 Go to http://www.apple.com/retail/montgomerymall/ to get a list of activities. I seldom find excuses to visit Montgomery Mall, but this store could prove to be an ice breaker. I'm going to drop in on a few of the educational sessions and I hope that the Pi can work up some sort of an alliance for training and membership referrals.